Congratulations! on the beginning of Post-Graduation in Business Management i.e. MBA. The day you started your college, you were on the cloud nine but slowly you must have started feeling that life is not so easy. MBA classes run for long hours and end with the burden of unlimited assignments, case discussions, and presentations. All these must be making you feel that you are not being treated like human beings. The situation gets worst when cutthroat competition among classmates to get a favourable credit score doesn’t make anyone a true friend which ultimately demotivates extremely. 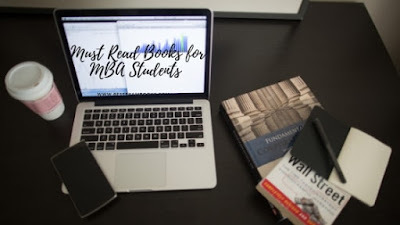 In this situation, if I suggest you to read a list of Must Read Books for MBA Students to get an edge over others, would you take me on a serious note? Yes, you should take my advice and must read given books to make yourself a deserved candidate for the job. Hirer in your campus must feel that you really deserve the job and you are the candidate they were looking for. Their search must end at you. If you are reading till this paragraph, it means you are ready to spare a few minutes from your hectic daily life to make you distinguished from others. You don't want to be a part of the crowd only rather wants to lead that crowd by making yourself superior from them. We assure you that this list will help you to make your mind pragmatic and you would get better insights into how management theories are being used in a practical world. Nothing comes easily, but reading habit always makes life easy. In your planner, keep one dedicated slot to read a good book other than your exam books which do not only enhance your skills but also make you better day by day. This book is full of stories which are written in very simple language. This simplicity compels readers to finish the book as each story reveals the mindset of the boss. To understand a work environment, one should understand why a boss moves in a particular manner? What makes him a good boss or a bad boss? In your career path, you would also become boss one day, and this book will help you to have the self-awareness. You would understand why OB subject tries to teach you the relevance of interpersonal relationships. You should read this book to understand what people do to obtain power, how far they go and what all things they do to have power at any cost. You should be careful while reading this book as it may make you believe in being unethical. Use this book to understand all ways and their impact only, not to apply all in your office. This book will help you to understand the role of boss, networking and image in the power center. Sometimes, reading such books are necessary as these help us to choose missing links between effort and success. Many times, success secret doesn’t fall into a category of ‘what to do’ but in ‘how to do’. Read this book to observe own habits and after effects of good and bad habits. This book is one of the most selling books and readers get benefitted by practicing these habits. You can also find several videos to have a better understanding of the book. For example-Check the link. Best Exam Books. Awesome Inc. theme. Powered by Blogger.